2 - 3..................Cocoa von Warringhof. 3 - 4..................Amor von der Weyermühle. 3 - 4..................Bingo von der Weyermühle. 3 - 4..................Gina von der Weyermühle. 3 - 4..................Dunja vom Worringer Bruch. 4 - 5..................Bastian von Goldschmieding. 4 - 5..................Anja vom Worringer Bruch. 4,5 - 5................Akim von Vaciweba. 4,5 - 5................Alfa von der Weyermühle. 4,5 - 5,5,5,5,5.....Bingo von Ellendonk. 4,5,5 - 5,5,5.......Cona von Niederkassel. Icaro vom Blitzkrieger passed the Körung in Sweden with 188 points out of 200 points and also passed working/breeding tests in Sweden. He has full dentition and tested as vWD carrier. Icaro was euthanised at 7½ years of age due to his owners inability to handle him. 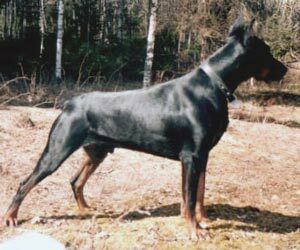 Icaro's sire, Baron vom Blitzkrieger, was titled to SchH 2 and lived to almost 8 years of age (was euthanised due to an elbow injury he developed later in life which eventually crippled him) while his dam, Faroh vom Blitzkrieger, lived to 4½ years of age (passed away prematurely from kidney "filter" damage caused by unknown toxin - it is believed she ingested anti-freeze coolant). Malinche: SchH 1 and passed the ZTP with 1A rating for character and SG for conformation.